Distinctive Fabric(USA) www.distinctivefabric.com The standard fur for suits. 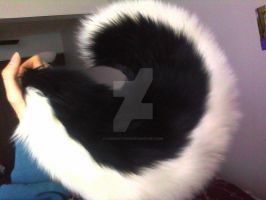 This fur is carried elsewhere, and colloquially known as "DF" fur. I'm Stuffed Fur(USA) www.imstuffedfur.com/ Wide selection, more than is shown on the website. Email Beverly to inquire about other furs not listed, very helpful when looking for odd or rare colors. Cr's Crafts(USA) www.crscraft.com Good selection of more realistic furs. Fabric Empire(USA) www.fabricempire.com/ Carries DF fur at a good price. Frequent sales. Mendel's(USA) www.mendels.com Good selection of interesting furs, rotates stock quite frequently. National Fiber Technologies(USA) www.nftech.com/ Expensive, but can custom make fur for you. Carries longer (up to 7in) fur, and makes stretch furs. Fabric Depot(USA) www.fabricdepot.com/ Good selection and prices. Mood Fabrics(USA) www.moodfabrics.com/index.php Selection of high quality faux furs, but remember that you have to pay for quality. Fursuitsupplies.com www.fursuitsupplies.com/ New reseller of commonly used furs at reasonable prices. Also carries other things like eye blanks and claws. Please comment below with any more RELIABLE companies, and I'll update this list! More to come, including teeth/claws/eyes/pawpads/resin casting supplies. This website is a brand new one, they just started stocking shag furs. Also they ship them out in clean rolls and have the best customer service i've yet experienced, ever! My absolute favorite! DF Fur: What is it and what are its qualities?Df fur is the colloquial name of the solid long hair fur carried by Distinctive Fabrics. It is the standard fur for toony suits. It's carried by a slew of online retailers, and pretty much everyone uses it because it comes in a plethora of colors (ok, well maybe not that many, but a lot compared to most styles of fur) and it's relatively inexpensive. The length advertised for it by different retailers varies from 1.5-2in, but they're all the same length. The naming of the colors also varies between retailers, which can get very confusing. Another notable aspect of this fur is the tone/shade of the colors vary between dye lots, so ALWAYS get a sample before ordering, or you could be in for a rude, expensive surprise. Digitigrade shaping adviceSo, let's start with canine/feline typed legs. These animals are built for running, and those huge thighed back legs are made for strong thrusting off the ground during the chase, and leaps and assorted carnivorous activities like that. More of the animal's weight is centered on their front legs, the hind legs are mostly for power. If you want to make a feral styled suit, by all means just tack these onto your suit/character's design, but they are inappropriate as-is for an anthro/bipedal design. Nothing irritates me more about character design than seeing an anthro with 'stock' digitigrade legs just tacked on (except flat footbottoms). The caption that goes with it: 1. Temporalis- This jaw muscle originates on the side of the brain case and takes up pretty much the entire side of the skull behind the eye sockets and above the zygomatic arch. It inserts into the uppermost part of the mandible. It is a jaw-closing muscle. Looking for leftovers and advicehey! I'm gonna start working on my first partial soon. I'm looking for any spare materials anyone might have and would like to get rid of! I'm also looking for someone experienced to help me through the process, to be my go-to when I need advice. I'm gonna do one of the cats from Lone Digger. A Fursuit Review Website: FursuitReview.comHi! I've stumbled across this website that I think would be super helpful for people to utilize. FursuitReview is a website that does as it's name pretty much suggests; it hosts reviews submitted by customers detailing their experience and quality of their fursuit made by their fursuit maker. Super helpful! The website's list of makers reviewed can be found here: http://fursuitreview.com/?page_id=6. And the list grows with every new review submitted (so they encourage submissions). Leds on toony eyes?hello all, so I am making a toony foam head that will need eyes made of plastic. The cusatomer told me to put leds in them but I don't really know where tpo put them and if they will blind the person that is going to wear them. I would like any suggestion from you guys! I hope to hear some feedback! Crystumes Wolf Partial | Taking Offers!After consulting with my dentist, we've confirmed I'll need to get my wisdom teeth pulled, so sadly this girl is up for offers on Furbuy to help cover the expenses. Here we have an absolutely amazing and beautiful wolf partial suit made by Crystume Costumes, late last year. Serious bidders only! All payments are to be sent through Paypal. Shipping from Australia; buyer pays shipping. Livestreaming @7pm centralStarting a bit early!! Here's a whole list of questions of possibilities that I'd highly recommend anyone take a look at and answer if they plan on making a suit. It might bring up some problems to think about before they happen during the process of making a costume. I'd copy/paste and print this off and answer to any questions that apply to your future project. 1. Do you relate to the creatures physical traits in any way? 3. Where will be an air vent(s)? 4. Where will the vision be? 5. Can you hear well in the suit? 6. Can people hear you clearly if you should speak? 7. How will the suit be taken apart in case of quick relief? 8. In what rooms or areas can you travel in your suit? 9. How heavy will some pieces of the suit be? 1. Can you sit on the floor in the suit? Useful links! Online resources and purchasing tipsFirst and foremost, GET SAMPLES OF YOUR FUR. All the websites have photos, but they are rarely accurate to the color of the fur in person, and dye lots can change slightly between runs, so the photo they have may not be accurate to their current stock either.